We have redesigned our Kpreps Kansas Game Day feature in order to provide you with a program for things to watch out for in Week 8 action. If you have suggestions for what you would like to see in future Game Day features, send us a message on Twitter or Facebook. While our helmet sticker feature typically comes out a couple of days after Friday’s action, we wanted to call attention to a special awareness campaign this month. 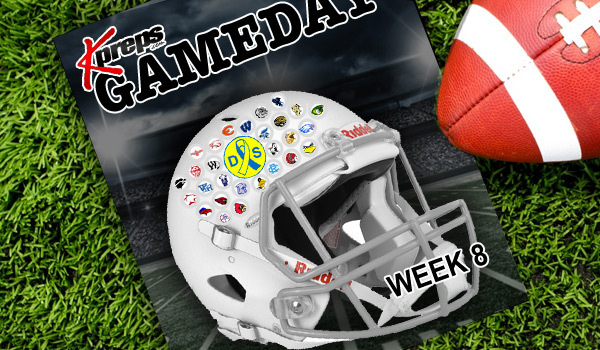 This week, Kpreps is proud to pass out our helmet sticker in honor of Down syndrome awareness month. We want to thank Chad Simon for his work in spreading awareness of Down syndrome and providing the information (and many stickers) to this campaign. More than 1,200 players from 27 Kansas high schools are wearing the Down syndrome helmet stickers throughout the month of October because they recognize that people with Down syndrome are unique and possess many gifts. People with Down syndrome are leading full and meaningful lives, working, attending high school, post-secondary schools, or getting married. We celebrate people with Down syndrome today and every day. The stickers were provided by the Northwest Kansas Down Syndrome Society (Hays) and the Flint Hills Down Syndrome Families Group. Schools participating in the awareness campaign range in size from as small as 6-man Wheatland-Grinnell to as large as Class 6A’s Washburn Rural. Teams participating in 2017 include: Clifton-Clyde, Colby, Dodge City, Ellis, Great Bend, Hoisington, Holton, Hoxie, Jackson Heights, Junction City, La Crosse, Maur Hill-Mount Academy, McPherson, Ness City, Norton, Phillipsburg, Plainville, Quinter, Riley County, Rock Creek, Russell, Shawnee Heights, Thomas More Prep, WaKeeney-Trego, Wakefield, Wamego, Washburn Rural, Wheatland-Grinnell. Team records in this segment refer to league/conference records unless noted. Derby (4-0) can clinch another outright AVCTL-I title with a win against Haysville Campus (2-2). A Derby loss coupled with a Maize victory over Hutchinson (2-2) would tie the Panthers and Eagles atop the standings; however, the Panthers defeated Maize 60-28 back in Week 3. Goddard has clinched the AVCTL-II title outright with a 4-0 record entering tonight’s game against Newton. The Railers are tied in the standings with Valley Center and Goddard-Eisenhower at 2-2. Not only has Maize South, McPherson, and Buhler been jammed together in the 4A-I rankings most of the season, the three schools also sit atop the AVCLT – III standings with identical 4-1 records. McPherson has completed its league schedule as the Bullpups district includes Hays, Wamego, and Abilene. Buhler and Maize South each have one league game scheduled. Buhler will be heavily favored against Towanda-Circle in Week 9, while Maize South will travel to Andover Central next week. Andale (4-0) is in position for another outright league title. The Indians play El Dorado (1-3) in Week 9 and hold the head-to-head tiebreaker over Mulvane (3-1) thanks to a 48-20 victory over the Wildcats in Week 3. There are two games remaining in the Big 7 Conference, but 3A’s top-ranked Nemaha Central Thunder (6-0) hold a one-game lead over rival Sabetha (5-1) after beating the Bluejays 21-7 last week. Both teams have league/district games remaining against Hiawatha (2-4) and Riverside (2-4). Three teams finished in a tie atop the Centennial League standings and will share the crown this season. This year’s league schedule counts only each school’s first six games against league opponents towards the league standings. Manhattan, Shawnee Heights, and Topeka High all finished Centennial League play at 5-1. Shawnee Heights opened the season with a 21-18 victory over Manhattan, the Indians then defeated Topeka High 21-14, while Topeka defeated Shawnee Heights 48-14. Of note, Shawnee Heights grabs a share of the league title it the T-Birds last season before moving to a new league, while Manhattan clinches at least a share of the league title for the ninth time in the last ten years. Pratt (6-0) holds a one game lead over Smoky Valley (5-1) and the head-to-head advantage over 2016 league-champion Hoisington (3-1). The Greenbacks defeated Hoisington, 35-28, back in Week 5. Pratt’s lone league game remaining is at Kingman (2-3) in Week 8. Meanwhile, Smoky Valley’s league schedule is complete. Hoisington has remaining district/league games against Larned (3-3) and Lyons (0-6). The CPL basically came down to the loaded Class 3A District 10. Cheney (6-0) and Conway Springs (6-0) will square off this week with league and playoff implications. Garden Plain sits right behind the pair of Cardinals at 4-1 in league play and still has to face Cheney to close out the regular season. The CNC title was basically decided a couple of weeks ago when Galena defeated Columbus 33-29 at Abbey Field. The Bulldogs (5-0) will be heavily favored in games against Southeast-Cherokee (0-3) and Riverton (1-5) the next two weeks. Southeast does not have a full league schedule this season to be considered in the standings. Columbus (4-1) plays at Frontenac (2-3) tonight in a game with important district implications. Colgan (4-2) has completed its CNC League schedule with close losses to both Galena and Columbus. Bishop Miege (6-0) has clinched the outright EKL title having completed its league schedule in the first six weeks before entering district play in Class 4A. The Stags defeated St. Thomas Aquinas (6-1) 27-14 back in Week 3, but did not play St. James Academy (6-1) this season. Aquinas defeated St. James 34-14 in Week 6. Lyndon (6-0) holds a one-game advantage on Osage City (4-1) in the loss column and has a head-to-head victory over the Indians, 30-17, back in Week 6. The Tigers will complete their league schedule this week at Chase County (1-4), while Osage City has remaining games with Central Heights (0-6) and West Franklin (3-3). De Soto (5-0) has clinched the Frontier League title with victories over Paola (5-1) and Louisburg (3-1). De Soto, which has one remaining league game with Eudora (1-3), defeated Paola 40-14 and Louisburg 41-0 in consecutive weeks earlier this season. Scott City (4-0) can clinch the GWAC title with a victory at Goodland tonight. The Beavers hold a one-game lead over Holcomb (3-1) in the standings by virtue of a 23-14 victory over the Longhorns back in Week 2. Holcomb’s final league game comes at Hugoton (2-2) next week. Bishop Carroll (5-0) can wrap up the Wichita City League title tonight with a victory over Kapaun Mount Carmel (3-2) in the “Holy War”. Wichita Northwest (4-1) is the only other team besides Carroll that has less than two league losses, but the Grizzlies fell to Carroll 40-35 on a late touchdown back in the season-opener. Ell-Saline leads the HOA League standings with an asterisk. The Cardinals finished 5-0 in league play followed by Marion (5-1), Hutchinson Trinity (5-2), and Sterling (4-2). The asterisk comes into play because Ell-Saline Sterling were locked up in a close game that was eventually suspended by severe weather. The two schools could not agree on a completion date/time and thus rendered the game a “no contest”. The decision may have helped decide the league race. Ell-Saline and Marion do not play this season. Cimarron (4-0) is in a great position to win the Hi-Plains League title in Greg Koenig’s first year as coach. The Bluejays have remaining road games against Syracuse (2-3) and Southwestern Heights (2-3). Cimarron holds a one-game lead over Lakin (4-1) as the Bluejays defeated the Broncs 32-8 last week. KC Schlagle is the league champion with a 4-0 league record ahead of tonight’s game against winless KC Harmon. The Stallions defeated Atchison 30-0 back in Week 3. Atchison is the only KCAL team with less than two league losses besides Schlagle. The Stallions remain in-line for the top seed on the east side of Class 5A for a second consecutive season. Tonganoxie is unbeaten and leads the standings in the Kaw Valley League’s final season. The Chieftains have a big game Week 9 when they host Basehor-Linwood (4-1). Tongy also takes on KC Piper (3-2) tonight. Bonner Springs (3-1) could also share a portion of the league title by beating Lansing (2-3) tonight, coupled with a Tonganoxie loss to Basehor-Linwood next week. The Braves defeated Basehor-Linwood 33-21 back in Week 5. Phillipsburg can wrap up an unbeaten MCL title tonight with a victory over rival Norton. The Panthers have defeated Smith Center (5-1) 23-0 back in Week 2. Norton (2-1) also has a league game with Thomas More Prep (2-3) next week. Once again, Silver Lake is the MEL champ thanks to a 5-0 record and a 41-14 win over Riley County back in Week 6. In his first season as coach, Josh Homolka has led Ellsworth (5-0) to the NCAA league title. The Bearcats picked up a key league victory over Beloit, 28-22 in overtime, back in Week 2. Ellsworth has completed its league schedule with remaining district games against Lyons and Larned. Marysville (4-1) and Clay Center (4-1) tie atop the NCKL standings this year. Marysville beat Clay Center 28-8 back in Week 5, but lost a league game to Concordia (3-2), 22-16 in Week 4. Clay Center defeated Concordia 28-26 back in Week 2. Jefferson County North (4-0) and Jackson Heights (3-0) are the only unbeaten teams in the Northeast Kansas League. Unfortunately, the Chargers and Cobras are not scheduled to play this regular season. Jefferson Co. North travels to Troy this week before one final league game at McLouth (0-4), while Jackson Heights hosts league-foe Horton (2-3) this week in its last league game. Wellsville (5-1), Santa Fe Trail (5-1) and Burlington (4-1) all remain atop the Pioneer League standings after seven weeks. If Burlington wins at Anderson County in Week 9, the three schools will tie for the league title. Santa Fe Trail and Wellsville have each completed their league schedule. Wellsville lost to Burlington 40-20 to open the season and defeated Santa Fe Trail 28-12 in Week 5. Santa Fe Trail beat Burlington 36-28 in Week 2. Labette County is in the driver’s seat to win the SEK League title with two games remaining. The Grizzlies (4-0) already have a win over Fort Scott (4-1) and can sew up the title with a victory over Chanute (2-1) this week. Chanute would need to upset Labette this week and beat Independence next week to earn a share of the title. Labette County also has a league game remaining at Coffeyville in Week 9. Shawnee Mission East (6-0) clinched at least a share of the Sunflower League title as well as the top seed in the 6A east bracket with last night’s win over Shawnee Mission West. Lawrence Free State (5-0) can share the title with the Lancers by beating rival Lawrence tonight. Shawnee Mission East and Free State will not meet this season unless they play each other in the 6A state title game. Jayhawk-Linn is the unbeaten TRL champions for a second consecutive season after the Jayhawks have posted an unbeaten 4-0 mark in league play. Three teams are still in the hunt for a portion of the Tri-Valley League title. Humboldt has completed league play with a 6-1 record with their lone loss coming to Caney Valley. Cherryvale has completed its league schedule at 5-1 with the Chargers’ lone loss coming to Humboldt. Meanwhile, Caney Valley (4-1) has two league games remaining with Neodesha (3-2) and at Fredonia (2-3). The Bullpups would need to win both to grab a share of the TVL title. Centralia (3-0) and Valley Heights (2-0) will square off this week in a game that will decide the TVL title and go a long way in determining the playoff qualifiers out of District 2. A loss by Valley Heights would eliminate the Mustangs from the playoff picture after beginning the season with six consecutive wins. Garden City (3-0) has clinched the WAC title again after wins over Hays, Liberal, and Dodge City. The Buffs play Great Bend (1-2) this week, but all other WAC teams have two league losses. There will likely remain a log jam atop the Central Prairie League standing this season. Central Plains (4-1), Otis-Bison (3-1), Macksville (3-1), and Victoria (3-1) all sit atop the standings. Only Central Plains has a league game left as the Oilers take on St. John (2-3) this week. Once again it looks like we will have a shared league title in the Heart of the Plains as Hutchinson Central Christian (5-0) and South Barber (5-0) do not meet during the regular season. Central Christian has one league game remaining against Burrton (1-4), while South Barber has completed its Heart of the Plains League schedule. Madison (4-0) and Burlingame (3-0) have finished unbeaten in the league Lyon County League and will not meet during the regular season. The MCL has just three 8-Man members in the league and the Hill City Ringnecks have defeated WaKeeney-Trego and Stockton to claim the league title. The massive 12-team Northern Plains League features unbeaten Pike Valley (4-0) and Sylvan-Lucas Unified (5-0) at the top along with by Mankato-Rock Hills (5-1), Beloit St. John’s-Tipton (4-1), and Osborne (3-1). Pike Valley hosts St. John’s-Tipton this week, while Sylvan-Lucas should be favored in remaining league games against Thunder Ridge and Wilson. Dighton is the only remaining unbeaten in NWKL play, although the Hornets do not play NWKL powers Hoxie (4-1), Atwood-Rawlins County (4-1), or St. Francis (3-1) this season. Dighton has one league game left against Tribune-Greeley County (1-1). Another three-team league, the Santa Fe Trail League title will be decided in Week 9 when Moscow (1-0) hosts Rolla (1-0). Moscow has posted consecutive wins over Deerfield and Minneola, while the Rolla’s lone victory came over Deerfield in Week 5. Like last season, West Elk (5-0) and Caldwell (3-0) remain unbeaten in SCBL play through seven weeks. Also like last season, the Patriots and Blue Jays do not meet this season. Spearville (5-0) has clinched the SPIAA title this season having completed its league schedule. The Royal Lancers are the only unbeaten team in the league after last week’s 64-16 win over Satanta. St. Paul will finish atop the Three Rivers League standings again this season after posting wins over Pleasanton, Chetopa, and Marmaton Valley. Marmaton Valley (3-1), Colony-Crest (2-1), and Pleasanton (1-1) all have one loss and are vying for second place. Hanover (4-0) remains atop the 8-Man, Division II rankings and unbeaten in TVL play. Clifton-Clyde (2-0) and Axtell (2-0) also remain unbeaten in league play. Hanover travels to Axtell in Week 9. The Wildcats have posted five consecutive shutouts since given up six points in each of their first two games. A third and final three-team race in the WKLL has already been completed. Logan-Palco posted wins over Triplains-Brewster (58-8) and Northern Valley (70-14) in the first two weeks of the season to claim the title. Little River is the 2017 Wheat State League champion by virtue of a 5-0 mark. The Redskins beat contenders Solomon (50-26), Wakefield (56-12), and Centre-Lost Springs (50-42) to claim the title. Little River has remaining district games at Ellinwood and against St. John. St. Mary’s Academy (4-0) has claimed the KCAA regular-season title after beating Wichita Homeschool (4-1) 60-38 earlier this season. The Crusaders can complete the unbeaten run through the KCAA with a win over Veritas Christian tonight. Pawnee Heights is the 2017 regular season champion of the 6-Man league with a 7-0 record. The Tigers are the top seed in the 6-Man tournament which kicks off tonight with a pair of first-round games. Pawnee Heights and No. 2 seed Cheylin each have a bye this week. The tournament opens with No. 5 Wheatland-Grinnell (3-4) at No. 4 Weskan (5-2) and No. 6 Western Plains (0-7) at No. 3 Golden Plains (5-2). Natoma forfeited the remainder of its season due to injuries and low numbers, while Fowler is ineligible for the playoffs given the Goldbugs’ switch to 6-man mid-cycle. Eight-Man, Division I, District 8 has revolved around three teams: No. 4 St. Francis, No. 5 Hoxie and Atwood-Rawlins County. All three squads have just one loss – to each other. Hoxie beat Rawlins County, but lost to St. Francis. Rawlins County defeat St. Francis. If Hoxie and St. Francis win by at least 21 points in its final two games, they would get the two district positions respectively. However, Hill City (5-2, 3-1 district) remains alive for the playoff berth. While the Ringnecks did lose 50-4 to St. Francis and are a heavy underdog, Hill City will play host to Hoxie on Friday and at Rawlins County to end the regular season. Hill City, under first-year coach Travis Desbien, won at Oberlin, 53-50, last week, part of an improved offense that has averaged 40.1 points per game. Last year, a 4-5 season yielded 28.3 points a contest. The Ringnecks have improved their win total for the third straight season and clinched its first winning record since ’14 and second since 2010. That year, also Hill City’s last playoff team, the Ringnecks went 11-2 and earned Eight-Man, Division I runner-up, the only time the Ringnecks have won a playoff game in school annals. Senior Ethan Hamel has played well this fall with 75 of 128 passing for 1,145 yards with a 14/7 TD/INT ratio. He leads with 618 rushing yards and 12 scores. Hill City is 1-11 combined against Hoxie and Rawlins County since ’04, but a win either or both of the next two weeks significantly changes the landscape in one of the state’s better districts. In Division I, District 6, both playoff spots are yet to be decided in a competitive district with Argonia-Attica (6-1, 3-0), South Central (6-1, 3-0) and Macksville (5-2, 2-1). Macksville lost, 23-16, to South Central at home earlier this season. A&A is home against Macksville on Friday and then at South Central to finish. The Titans have reached the postseason three straight years, including district runner-up to South Central last fall. South Central has four straight playoff appearances. Improved Macksville is looking for its first playoff berth since 2011 that concluded a long run of excellence that featured a perfect season in ’07. The Mustangs have already improved its win total for a fourth straight season and has its first winning season since a 10-1 mark in ’11. Macksville has enjoyed a huge improvement defensively. Last year, the Mustangs permitted 42.7 points per game and tallied 34. This year, Macksville has averaged 35.8 points a contest and permitted 19. Macksville is plus-12 in turnover margin, including four interceptions and a fumble recovery from senior Kreed Parr. Last year, Sylvan-Lucas improved from 3-6 to 6-3. The Mustangs improved from 43.3 points allowed in ’15 to 29.2 last season, a drop of 14.1 points, which ranked 11th-best in eight-man football. This year, Sylvan-Lucas has again had another big drop. The Mustangs suffered its first loss, 46-6, at Northern Valley last week but still remain in strong standing for the runner-up spot from Eight-Man, Division II, District 5. Sylvan-Lucas has permitted just 13.4 points a contest, sixth-best in the classification. A playoff berth would mark just the second for Sylvan since ’06. Sylvan and Lucas joined together before the 2010 football season. Another win would mark the most victories in a year since the consolidation. Coach Ben Labertew returned seven starters, all both ways, with seniors Caiden Rivers, Dominick Montiel, Dylan Streit, Darren Ammon, R.J. Haberer and juniors Tyler Barrienties and Sam Princ. Sylvan-Lucas is at Thunder Ridge (2-5, 2-1) this week and finishes with one-win Wilson.